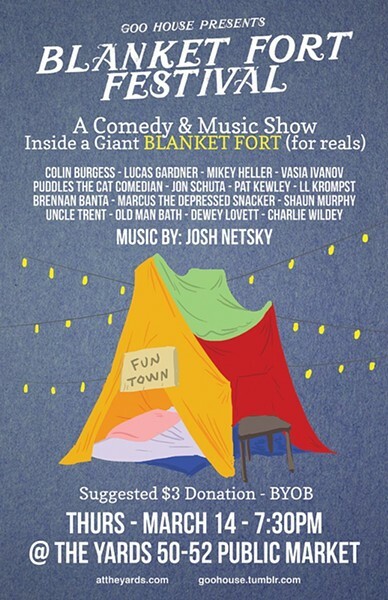 A fun comedy and music variety show inside a MASSIVE BLANKET FORT! We'll all arrive as strangers but we'll leave as friends wearing footie pajamas. Featuring Colin Burgess, Mikey Heller, Jon Schuta, Lucas Gardner, Vasia Ivanov, Dewey Lovett, Marcus the Depressed Snacker, Pat Kewley, Shaun Murphy, Uncle Trent, Charlie Wildey, Brennan Banta AND YOU! Hosted by Goo House. Music by Josh Netsky.